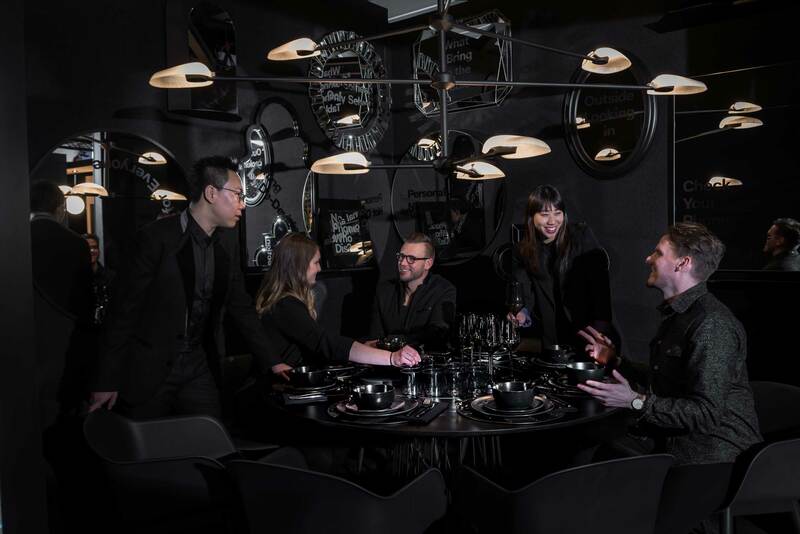 Held annually in March, DIFFA invites local and international designers to transform a raw space into a showcase of over-the-top dining environments for its annual fundraiser called DINING BY DESIGN (DBD). 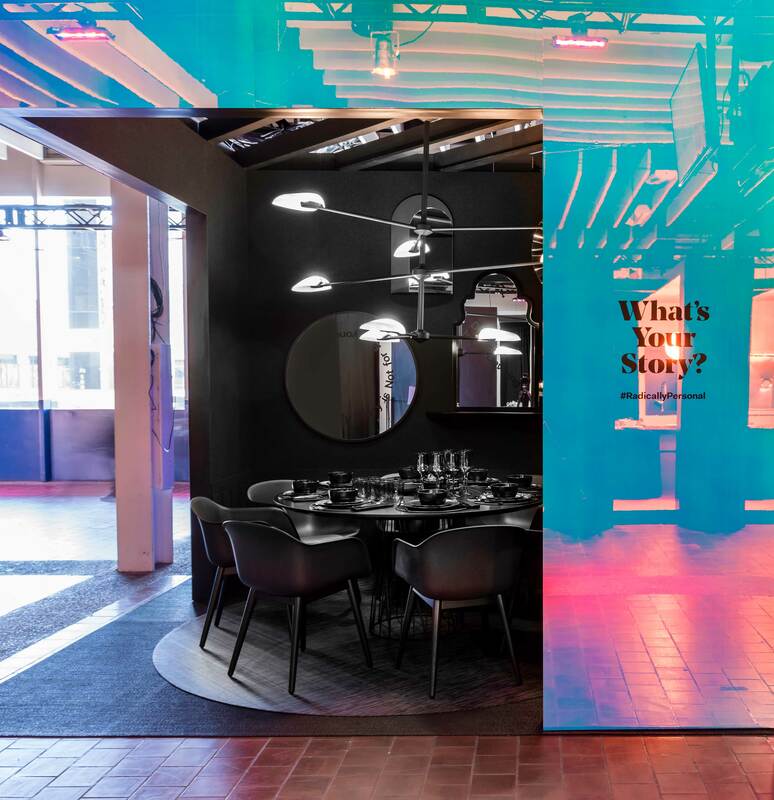 Co-located with the Architectural Digest Design Show, DIFFA’s signature event gathers thousands of supporters at Pier 92 in New York to fundraise for a cause. The event combines a worthy cause and exceptional design into a five-day event with more than 2,000 people at the two fundraisers. For our first Dining by Design in New York, the Rapt Studio team designed around human connection in the most fundamental way. Our design centered around a device-free dinner table—complete with smartphone storage and revolving tabletop. Inspired by the notion of being “Radically Personal,” diners at the gala dinner event were encouraged to share stories sans the ever-present distraction of digital devices. 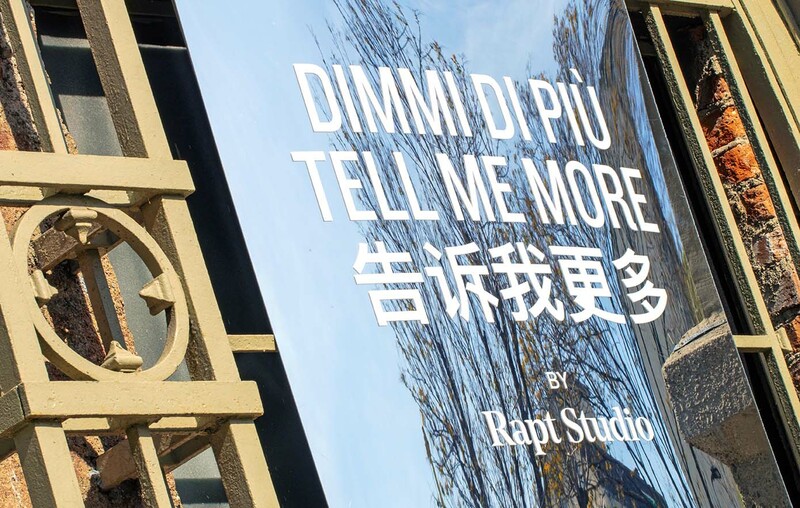 Our gala dinner guests included Rapt Studio client partners and design journalists. In order to draw in guests over the course of the public viewing days, we clad the outside of our installation in an eye-catching dichroic film, and posed the question “What’s Your Story?” Many took to social to share reflective selfies with the installation and their interpretation of what’s #RadicallyPersonal to them. The colorful exterior challenged passersby to take a deeper look and have an introspective, reflective moment. 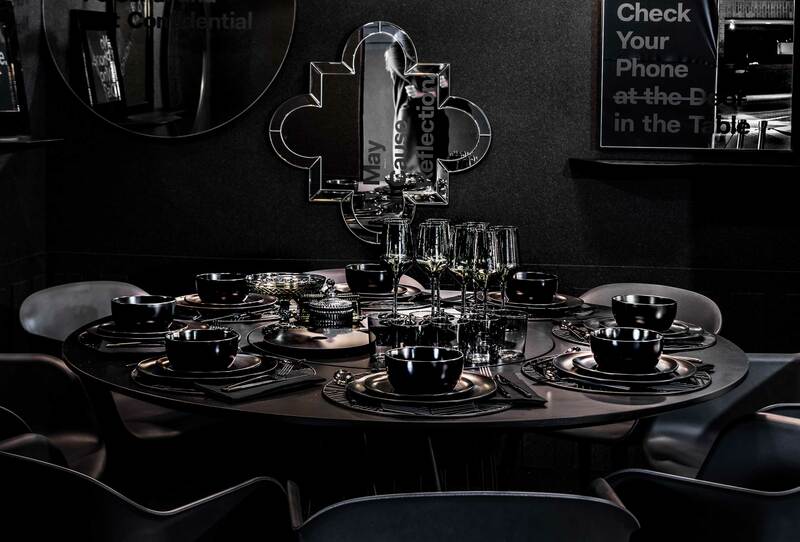 Inside, we created a dark, monochromatic look where all the black elements blended together resulting in a dramatic contrast to the outside. Our intention was to strip away distraction and allow the personality of the human diners to come through. Atop layered Bolon floor coverings is a custom table, designed in collaboration with and provided by MASHstudios. The walls were clad with BuzziSkin felt, in a custom wainscoting pattern, adding dimension, texture, and sound-absorption. BuzziSpace also provided BuzziPlank shelves and a BuzziMirage mirror. 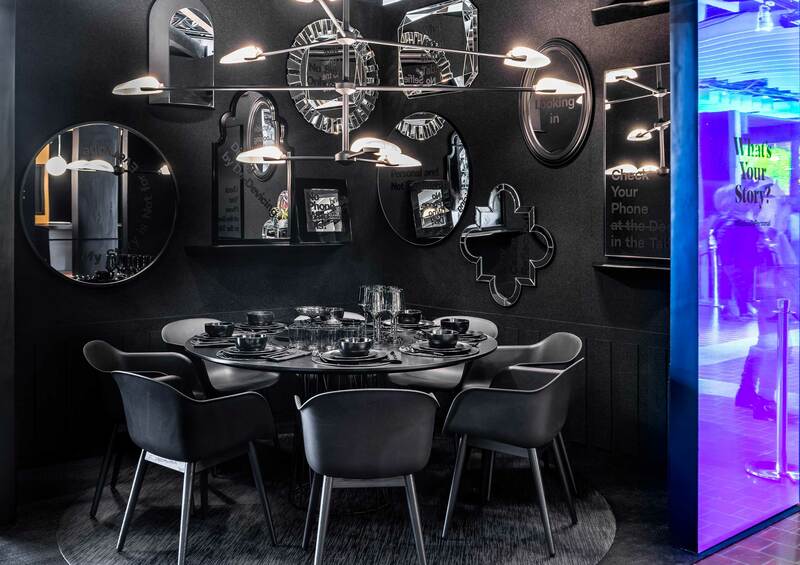 The space was dramatically lit with a Rich Brilliant Willing Pilot chandelier in matte black, and 8 muuto fiber armchairs, lent by ORI, complete the dining space. The installation exterior and the graphic moments on the mirrors inside were fabricated by Drive21. The overall build-out was managed and assembled by Qwest Contracting. 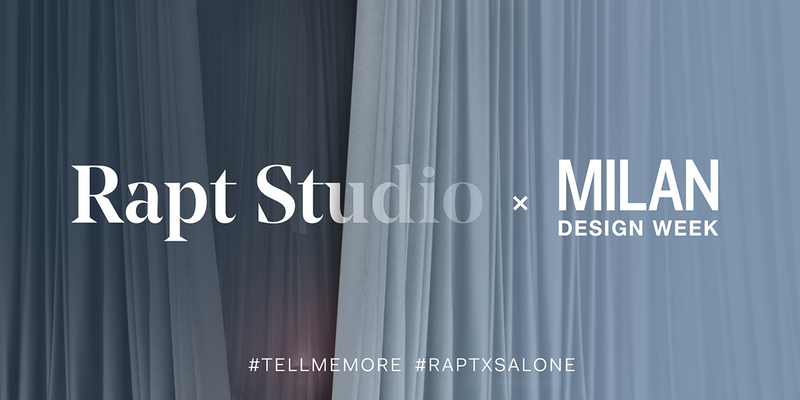 Along with our partners in this event, Rapt Studio is proud to support DIFFA (Design Industries Foundations Fighting AIDS) in this year’s Dining by Design fundraising event. Photography provided by Alan Barry. 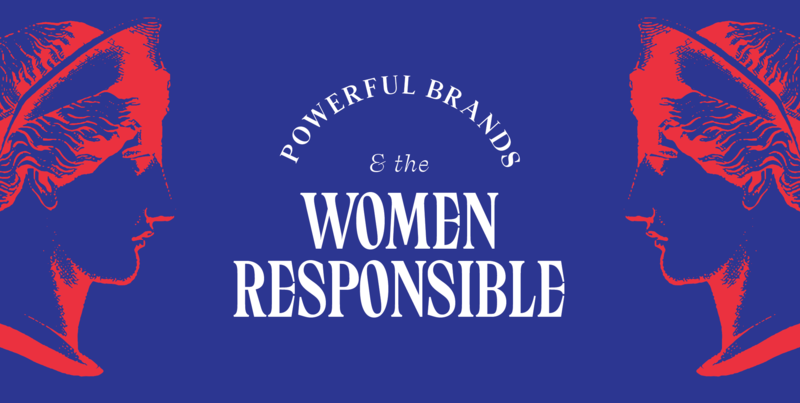 Interior Design – Trend of the Week: Cindy Says… Give Back!